Ordering your Lexmark 1855 toner cartridges at the UKs top rated online store allows you to start saving loads of time and expense. We've got a low price promise and that means you only get fantastic offers on any Lexmark 1855 toner cartridges without having to shop with overpriced electronics suppliers Additionally, Cartridge Save will only will offer you Lexmark 1855 toner cartridges which are both inexpensive and precision engineered so then you'll have reassurance with every order! We'll give you fast and free delivery for Lexmark toner. This specific lower priced Lexmark 1855 toner can be purchased at our checkout page so don't lose out and buy as soon as you can while stocks last. Meanwhile, you can get your hands on a discount priced Lexmark 1855 toner by simply ringing through on our customer order number in person when the time suits. Customer happiness is our top priority and we give you a comprehensive money back guarantee for Lexmark 1855 toners to guarantee that you receive 100% satisfaction. We're giving you fast delivery, high quality cartridges and the cheapest prices. It makes sense to pick us for 1855 toner cartridges. 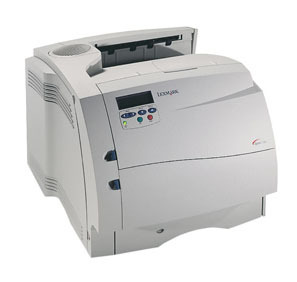 The Lexmark Optra S 1855 is part of the Optra S series of monochrome laser printers aimed at small offices. The Optra S 1855 black and white laser printer is a compact and user-friendly device. Although the Lexmark 1855 Optra S has fast print speeds, excellent compatibility with a range of printer languages, and some promising expandability features, it is still somewhat inefficient for the growing office and creative environments. The compact cube-shaped frame of the Lexmark Optra S 1855 printer allows it to fit into any office desk without occupying a lot of space, though more installation space is required at the front because the device is only 19.5 inches deep. It weighs 19Kg, which is slightly heavier than its predecessors, yet it stands 13.2 inches tall and spans 16.7 inches wide. The Optra S 1855 mono laser printer runs on an NEC 133MHz processor with 4MB of memory, and centronics IEEE parallel as the main interface. The media feeders include a 250-sheet input tray and 100-sheet multi-purpose tray, while the output bin can handle 250 sheets. In best mode, the print speed is up to 18ppm. Users may integrate an optional envelope feeder into the Lexmark Optra S 1855 monochrome laser printer. The high 1200x1200dpi resolution ensures crisper and sharper output. The memory of the Lexmark Optra S 1855 workgroup laser printer is expandable to 132MB, while dual media path types offer more versatility for custom-sized media. The cheapest Lexmark Optra S 1855 printer toners are not made by Lexmark but they can still achieve high quality output at a reduced cost. The Optra S1855 could be a more economical choice if it offered two-sided printing as a standard. Ethernet is optional, too. The paper capacity of the Lexmark S 1855 is limited to 350 sheets, and support for a range of speciality media is limited to transparencies, labels, and envelopes.